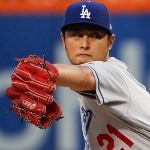 Japanese RHP Yu Darvish made his National League debut today with the Los Angeles Dodgers to lead his new team to a 6-0 shutout of the New York Mets. After being traded from the Texas Rangers, the Japanese right-hander threw seven innings, allowed three hits and struck out twelve batters to take the win. For the Mets starter Jacob deGrom fell to 12-5. Relievers Josh Fields and Venezuelan Luis Avilan, one inning each, were in charge of completing the shutout, while shortstop Corey Seager and left fielder Chris Taylor, led the Dodgers offense. Taylor went two for three, with one walk, one homer, one RBI and three runs scored, while Seager was three for four, with two doubles and one walk. The Milwaukee Brewers also won by shutout as they defeated the Tampa Bay Rays 2-0. Milwaukee was led by shortstop Orlando Arcia, who went three for three and also contributed with one RBI. In other games, the Cincinnati Reds defeated the St. Louis Cardinals while Boston Red Sox defeated the Chicago White Sox in 11 innings. Both games ended 3-2. In Cincinnati Asher Wojciechowski improved to 2-1, while closer Raisel Iglesias, earned his 19th save. Meanwhile in Boston Heath Hembree improved to 2-3, while Aaron Bummer (0-2) is still winless as he took the loss for the White Sox. The Minnesota Twins defeated the Texas Rangers 8-4 led by 44-year-old veteran pitcher Bartolo Colon, who won his 236th game in 20 seasons and threw a complete game to become the oldest AL pitcher since Nolan Ryan to do so. This was Colon’s first win as a Twin since being traded from the Atlanta Braves earlier this year. For the Rangers Martin Perez took the loss to fall to 5-10. Finally, after three failed attempts, the Houston Astros clinched their 70th win of the season as they defeated the Toronto Blue Jays 16-7 led by first baseman Yulieski Gurriel who went three for three with a double, a homer, two walks and three RBIs.